They have a position with Employer Brand in the title (not every business does this yet. LinkedIn lists only 2,163 people with “Employer Branding” in their title in the world, meaning that millions of businesses do not have an Employer Branding position. 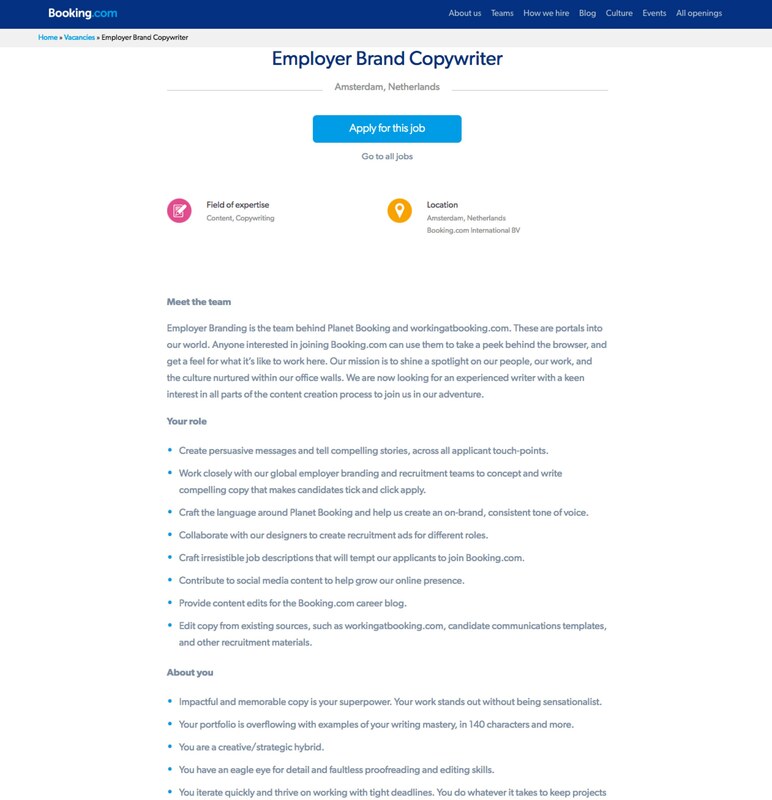 The position below is for “Copywriter” — this is marketing-speak for someone who can produce content that will persuade someone (the candidate) to buy. You typically only hear of copywriters at Ad Agencies or direct-marketing firms. This shows that Booking.com gets it when it comes to tying together recruiting and marketing/advertising. They have dedicated a URL (WorkingatBooking.com and PlanetBooking) for the sole purpose of what it’s like to work at Booking. They didn’t just settle for a section of their Career home page (e.g. Booking.com/Careers). These are all signs that Booking.com is serious about their employer brand. About the Author — Rob is the Co-founder & CEO of Ongig which is on a mission to help you hire the best talent faster through the world’s best job descriptions stored in the Cloud. Yelp, Autodesk, Verizon Digital, GoDaddy, Auction.com and BMC Software are among the early customers of the Ongig SaaS.